Logitech makes some of the best third-party accessories for iPhones and iPads, a few of which can even be purchased directly from Apple at very competitive prices. Just think of the $69.95 Logitech Crayon, which substantially undercuts the $99 and up Apple Pencil. Or the $69.95 Logitech Powered wireless charging stand, or $130 and up Logitech Slim Combos with detachable keyboards for previous-generation iPad Pros. Oddly enough, Logitech still doesn't sell any keyboard accessories tailor-made for Apple's newest iPad Pro models, but that's finally set to change later this month. The Slim Folio Pro looks and sounds extremely similar to the first-party Smart Keyboard Folio, starting however at only $119.99. That's a whopping 60 bucks cheaper than Apple's own 11-inch option, while the Logitech Slim Folio Pro for 2018's 12.9-inch iPad Pro will cost $129.99, compared to the $199 price tag of its Apple-made counterpart. Impressively enough, it doesn't seem like Logitech has had to cut many corners or make any big compromises to go this low in terms of retail prices, as the Slim Folio Pro ticks all the essential boxes of a robust "all-in-one case"... and then some. You get both front and back protection against scuffs, scratches, and spills for your new 11 or 12.9-inch iPad Pro, an "edge-to-edge" backlit keyboard design aimed at stellar productivity, and even a special magnetic latch to safely store your Apple Pencil when not in use. Without a doubt, the best thing about this overall top-notch Smart Keyboard alternative is its battery life, rated at "up to three months" on a single charge. 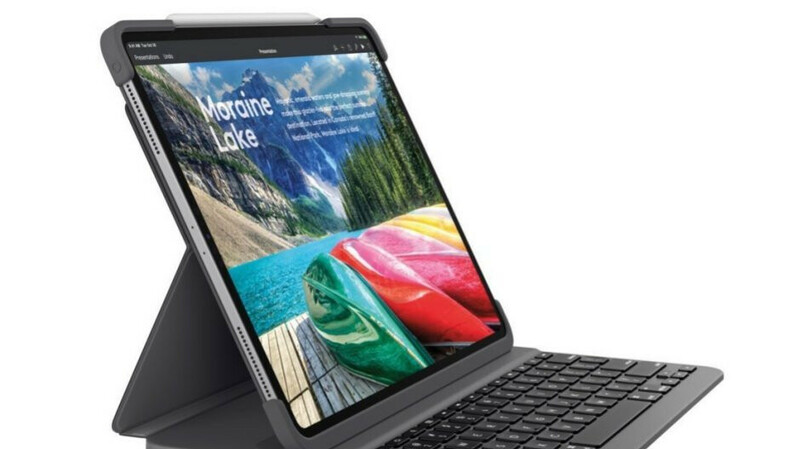 The Slim Folio Pro is also pretty versatile, enabling comfortable typing, sketching, and reading experiences by propping up your iPad Pro, sliding underneath it, or effortlessly folding back. The only possible drawback is the use of Bluetooth technology to wirelessly connect to Apple's latest powerhouses rather than leveraging their magnetic Smart Connectors. But Bluetooth keyboards can be reliable too, so if you want to save a few bucks, you should definitely consider the Logitech Slim Folio Pro... when it actually goes on sale.